Every morning, Mitchell wakes beside his cougar girlfriend Marsha, to find that he’s more mechanical than the night before. This is neither a metaphor for sexual prowess, nor is he turning into the latest and greatest toasters of all time. More and to the point, he appears to be simply turning into a collection of random machine parts, serving no great purpose, like a living and breathing pile of junk. After breaking Marsha’s leg during their last episode of coitus, Mitchell decides to figure out what assembly line he came from. Already hated by former classmate and son of Marsha, Mitchell travels this last part of his life alone, since becoming more machine than man, he’s lost any and all emotional attachment to Marsha. If the premise isn’t interesting enough, the layout of the story changes along with the protagonist. The print starts out in a type of handwritten scrawl. As Mitchell’s transformation progresses, so does the typeset from handwriting to type to schematic layout. All of this is followed by chapters serving as prologues for the lives touched by Mitchell’s life in some fashion. What is most interesting is the chapter comprised entirely from other sources, ranging from reviews, articles, other books, and a paraphrased line from an e-mail between friend and author. What is most important about all of this, the story is able to hold its own, built with a foundation almost as strong as the main character. Even though the story is oddly similar to another major release within the last year, the two books could not be any more different. 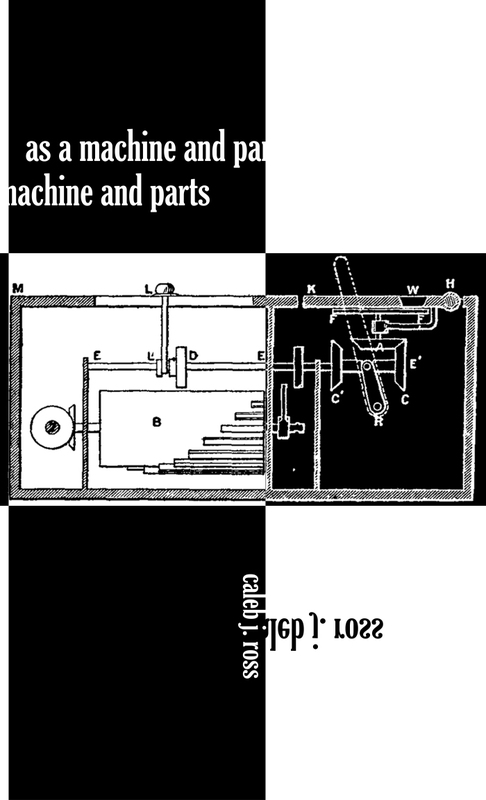 Ross’s As a Machine and Parts is darker, more literary, and technically sound when it comes to the format. As is usually the case with Max Barry’s writing, Machine Man is well written and entertaining, but it hardly sinks its teeth into the reader the way that As a Machine and Parts does. Ross is easily the powerhouse here. His characters stay with you. Even turning into a machine, Mitchell is more human, he’s a rounder character, more real. Ross’s writing doesn’t allow you to question the possibilities. You don’t have the time to wonder if this story were real. The sharp dialogue and poetic narrative either pulls you along for the ride or lays you to waste in a euphoria of grotesque domestic fiction. The only drawback, and perhaps this is just a minor complaint, is the length. Although As a Machine and Parts is dubbed a novella, the story is far too rich. There’s a beginning, a middle, and an end. However, you’re still left wanting, there’s room for more. The book is a complete story, but there’s room for so much here, and so when the final page is turned, you’re left with the satisfaction of time well spent. But the empty breeze inside of you, that nagging whine in the back of your head that it is over all too soon gets too loud to ignore. This entry was posted in Reviews and tagged As a Machine and Parts, Caleb J Ross, I Didn't Mean to Be Kevin, Machine Man, Max Barry, Stranger Will. Bookmark the permalink.